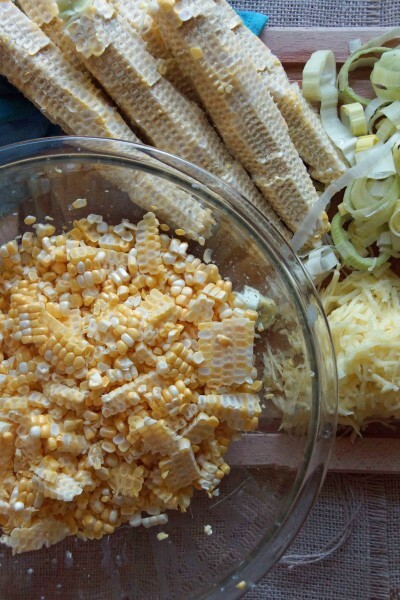 Pull the husks and silky strings from the corn and scrape off all the kernels with a sharp knife. Stop! Don’t throw the cobs in the trash. Save them and use them to make a quick vegetable that will do wonders to enhance the corniness of our corn soup. 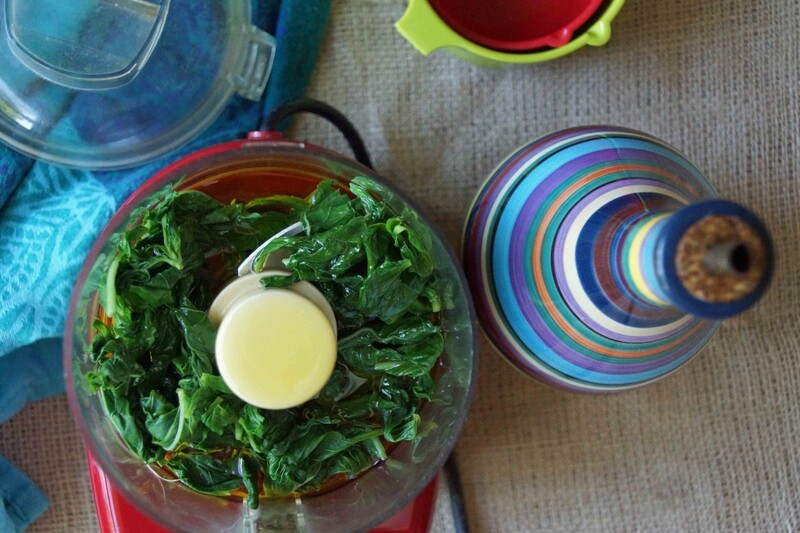 While you’ve got your stock bubbling away, make a batch of basil oil to use as a soup garnish. Blanch a pile of basil leaves then puree the leaves with lots of olive oil. Strain out the little bits and you’re done. Okay, the stock is ready and we’ve already made our garnish. It’s time to actually make the soup. Don’t worry, it’ll be quick. 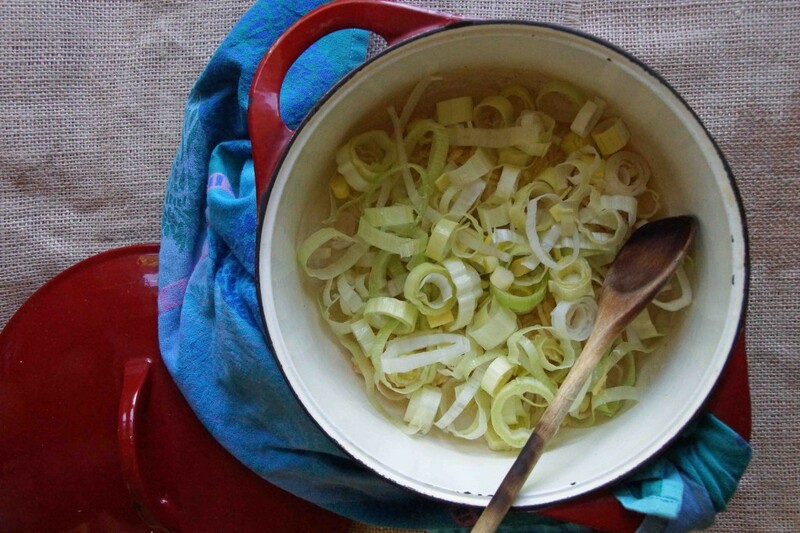 Just stew sliced leeks and grated potato until tender then add the sweet corn and stock. Simmer for all of 10 minutes. Let the soup cool slightly, then puree. This is the reason I have an immersion blender. Just stick it in and buzz until the soup is smooth and uniform. Add a touch of cream. Taste and adjust. Ladle the soup up into bowls. Drizzle it with basil oil and dollop with fresh, creamy ricotta cheese. 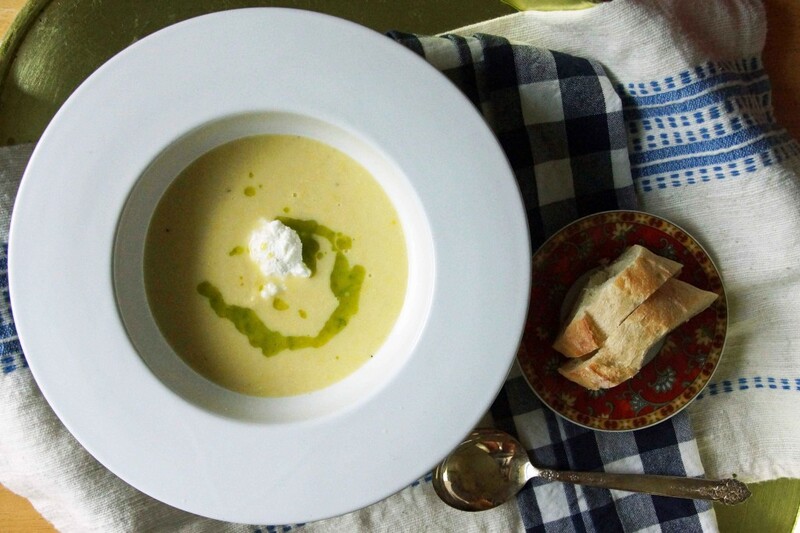 It’s super fresh, super simple sweet corn soup and you’re going to love every last spoonful. 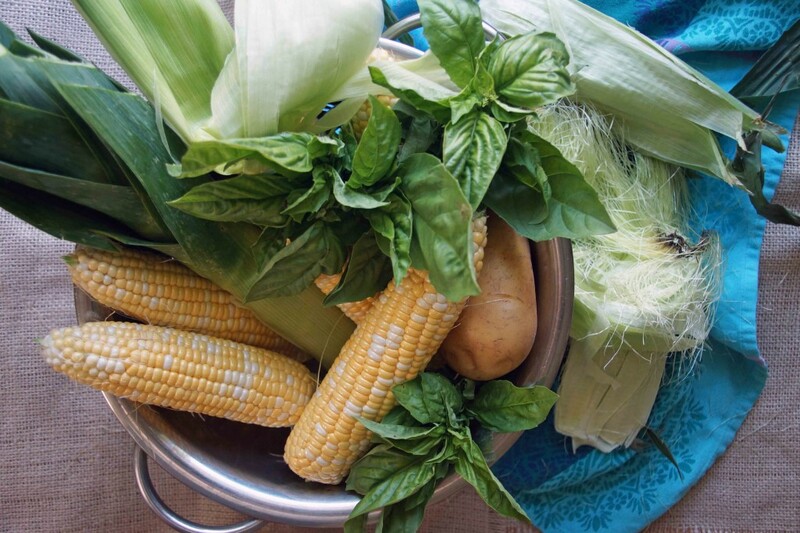 I make this soup every summer when sweet corn hits the market, but I switch up the garnishes from year to year. Last summer, I was really into placing goat cheese-smeared crostini and a dollop of tomato jam in the center of the bowl. Crispy bacon or pancetta is awfully good, too. In a wide soup pot or Dutch oven, melt the butter. Add the leek and potato. Season with salt and cover with about 1 c. of water. Cover and stew over medium heat until the vegetables are fairly soft and most of the water has been absorbed, about 10 minutes. 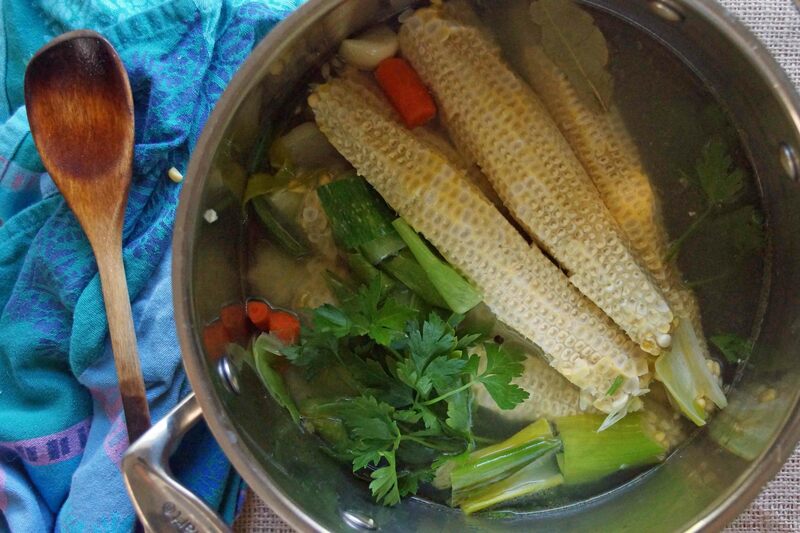 Add the corn kernels and the stock. Bring to a boil, then reduce to a simmer. Simmer until the vegetables are soft and the flavors have blended, about 10 minutes. Allow to cool briefly before proceeding. Meanwhile, make the basil oil to use as a garnish. Bring a medium saucepan of water to a boil and plunge the basil into the boiling water for about 10 seconds, until it turns very bright green. Pour into a colander and run cold tap water over the basil to stop the cooking. Squeeze out as much water as you can with your hands, then pat dry with a paper towel. 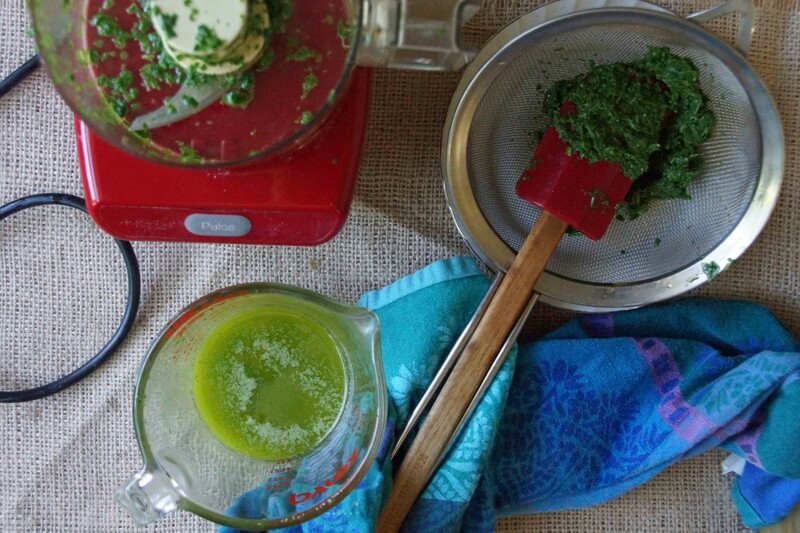 Puree the basil using a mini food processor, blender, or mortar and pestle. Add the olive oil and blend until well combined. You can leave it like this or put it through a fine mesh sieve to strain the pieces of basil out. After the soup as cooled slightly, puree using an immersion blender or in batches in a regular blender or food processor until it is quite smooth. Again if you want something very, very smooth, you could pass it through a fine mesh sieve. Add the cream and gently reheat the soup. Taste. Season with freshly ground black pepper and salt, as needed. 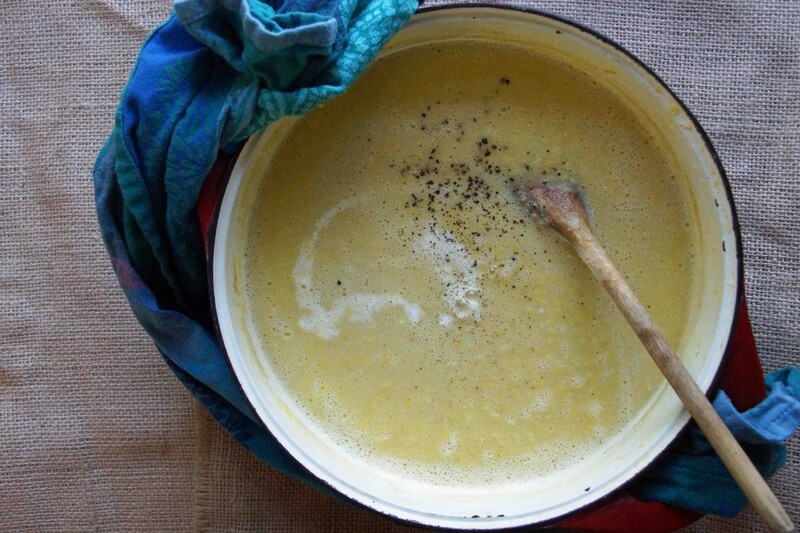 Divide soup between warm bowl. 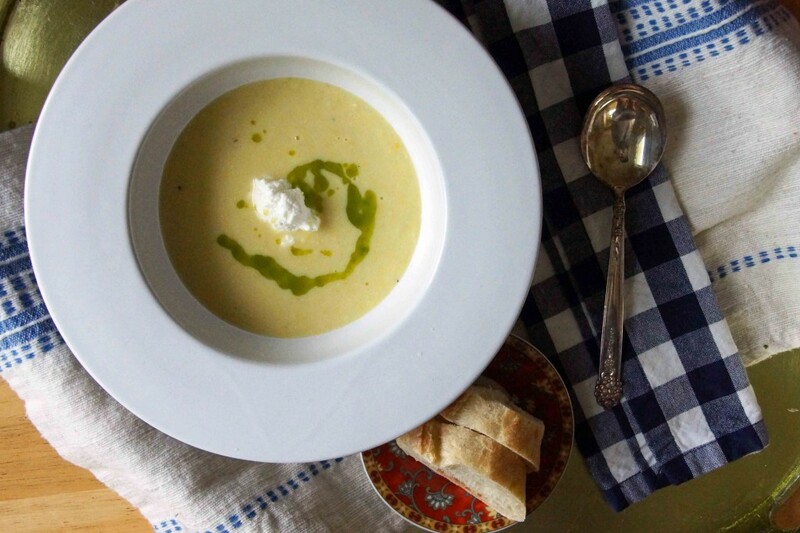 Spoon a dollop of ricotta cheese into the center of each bowl and drizzle the basil oil over the top. *The trimmings left behind from the vegetables just beg to be made into stock. Just heat a little olive oil and sauté a chopped carrot or 2 and a chopped stalk of celery with the chopped leek trimmings. Add about 2 quarts cold water and the corn cobs along with a little salt, a smashed clove of garlic, a bay leaf, a few peppercorns, and a handful of parsley. 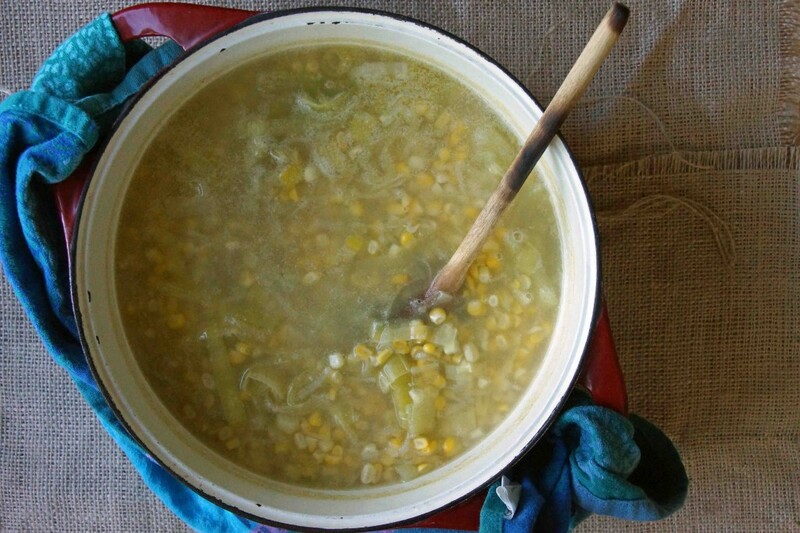 Simmer for 30 minutes, then strain and use in your soup to enhance the sweet corn flavor. **You will likely have leftover basil oil. Drizzle it over grilled vegetables or on a Caprese salad. It will keep in the refrigerator for several days. Oh wow…now I have two soups to try. I actually got some late summer strawberries at a farm in New York so I am going to try your Strawberry Soup and since I also picked up some sweet corn while I was there this will have to be made as well. Perfect!!! !